Designed for at-home use, REMBRANDT DEEPLY WHITE 2-Hour Whitening Kit provides a customized dentist-like whitening experience for a whiter, brighter smile. * In just one two-hour treatment, this kit safely whitens deep stains for noticeably brighter teeth. The whitening kit contains exclusive COMFYTRAY applicators that conform to the unique shape of your teeth, and peroxide-based whitening gel that won’t harm tooth enamel. Safe and effective, REMBRANDT DEEPLY WHITE 2-Hour Whitening Kit makes it fast and easy to feel confident about your smile. 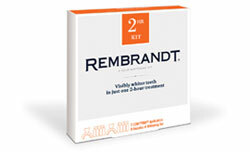 REMBRANDT 2-Hour Whitening Kit noticeably whitens teeth in just one two-hour treatment that you can do right at home. The kit contains a special whitening gel with the same potent, enamel-safe whitening ingredient used by dentists to remove deep stains, along with specially designed COMFYTRAY plastic applicators that mold easily to the shape of your teeth. Noticeably whitens teeth in just one two-hour treatment that you can do at home. 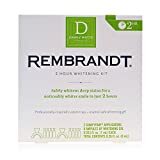 REMBRANDT 2-Hour Whitening Kit contains a special peroxide-based whitening gel that goes to work immediately on contact to remove deep stains both on and below the surface of your teeth. The specially designed COMFYTRAY applicators provide the perfect delivery system for the whitening gel and, as the name suggests, make it a more comfortable experience. Why Use REMBRANDT 2-Hour Whitening Kit? The REMBRANDT 2-Hour Whitening Kit is a safe, effective at-home solution for noticeably whiter teeth, even at the last minute, so you can always feel confident about your smile. Q. How long will the whitening results last? How can I maintain that level of whiteness? A. Teeth eventually lose their whiteness after treatment due to pigmentations from the foods and beverages you consume, so the amount of time varies by person and diet. To maintain your white teeth, use REMBRANDT 2-Hour Whitening Kit as directed, about every six months, and use REMBRANDT whitening toothpaste as your everyday toothpaste. For optimal results, brush regularly with REMBRANDT DEEPLY WHITE + Peroxide Fresh Mint Toothpaste and rinse with REMBRANDT DEEPLY WHITE + Peroxide Whitening Mouthwash. Q. Can I use REMBRANDT 2-Hour Whitening Kit if I have dental work? A. If you have dental work, consult your dentist before using. REMBRANDT 2-Hour Whitening Kit will only whiten natural teeth; it will not whiten caps, crowns, veneers, fillings, bridges, or dentures. You should not expect any damage to restorative work from using this product. Do not use this product while wearing overnight dental appliances. Q. Will REMBRANDT 2-Hour Whitening Kit cause irritation to sensitive teeth or gums? Can I use it if I have gum disease? A. Use of whitening gel can cause temporary tooth sensitivity and/or irritation of the gums, which usually goes away within a few hours to a few days. If the problem persists, please consult your dentist before resuming use of whitening gel. To reduce likelihood of irritation, use only a thin ribbon of whitening gel in the applicator trays, as indicated in the directions. If you have gum disease or receding gums, consult a dentist before using REMBRANDT 2-Hour Whitening Kit. Q. What makes REMBRANDT 2-Hour Whitening Kit different/better than other whitening kits on the market? A. REMBRANDT 2-Hour Whitening Kit is the only at-home whitening kit with specially-designed COMFYTRAY applicators that conform to the unique shape of your teeth, providing you with a more comfortable, customized whitening experience. When it comes to at-home teeth whitening, REMBRANDT was the pioneer. REMBRANDT launched the first professional-grade whitening toothpastes, developed by leading cosmetic dentist Dr. Robert Ibsen, back in 1989, and it remains the innovator in the whitening field today. Unlike other whitening brands, REMBRANDT stays single-mindedly focused on teeth whitening. Its highly effective products continue to raise the standard for at-home whitening. REMBRANDT 2-Hour Whitening Kit with two COMFYTRAY applicators, two syringes, and instructions. This entry was posted in Dental Shop and tagged 2Hour, Deeply, Rembrandt, White, Whitening by Oral Health Care. Bookmark the permalink.